Ever wonder what exactly happens during the application process of placing porcelain veneers on your teeth? Well, now you don’t have to wonder anymore. Chicago’s cosmetic dental practice Sugar Fix Dental Loft is here to explain all. Sugar Fix Dental Loft believes in preserving your mouth’s natural teeth. When Dr. Emery performs a cosmetic procedure such as porcelain veneer application, she attempts to limit the amount of healthy tooth removed and focuses on conserving the teeth your body created whenever possible. Porcelain veneers enhance the appearance of the teeth and do not restore strength or functionality; they serve a cosmetic purpose. Thus, the tooth that needs repair should be relatively healthy with no evidence of decay. If all looks good, Dr. Emery will schedule your first appointment and you’ll be on your way to having a gorgeous smile in no time! When you arrive for your first appointment at Sugar Fix Dental Loft’s Lakeview location, an impression is taken of your teeth. The mold is sent out to a laboratory where your customized porcelain veneers are fabricated. Upon returning for your next appointment, the porcelain veneers are placed over your natural teeth and bonded with dental cement. To apply a porcelain veneer, a very small amount of the original tooth enamel needs to be removed in order to shape and prepare the teeth for the placement of veneers. By very small, we mean less than a millimeter! Disregard all the awful thoughts running through your head about your teeth being shaved down until there is nothing left. That will not happen. The minuscule fragment of original tooth enamel needs to be removed because it creates room for the porcelain veneer to fit within the mouth. It is essential to accurately restore natural tooth function while creating an improved appearance of the original tooth. 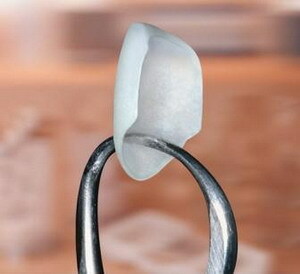 The bond between original tooth and porcelain veneer is critical. It not only provides the esthetic perfection desired, but also a strong bond, which is essential for correct veneer function. Light-sensitive resin (the basis of adhesives) is placed between the original tooth and the veneer and then solidified permanently in place using a special curing (hardening) light. Dr. Emery will polish your sparkling new veneers to ensure they look and feel beautiful. Believe you me, she will not let you walk out the door without being 100% satisfied with your veneers. An alternative to traditional porcelain veneers are minimal preparation or “no-prep” veneers, which do not require Dr. Emery to remove as much original tooth material. No-prep veneers are bonded to the front surface of your teeth. Without having to take off small amounts of original tooth enamel, the no-prep process takes less time. Think this might be for you? Dr. Emery will determine if you are a candidate for minimal preparation veneers or if traditional is the way to go in your particular case. Contact Sugar Fix Dental Loft today and schedule a consultation with Dr. Emery to see if porcelain veneers are right for you.